The Occupational Safety and Health Administration (OSHA) issued a new rule to improve tracking of workplace injuries and illnesses. Maximum penalties for serious and other‐than‐serious violations increased from $7,000 to $12,471 per violation. Maximum penalties for failure‐to‐abate violations increased from $7,000 to $12,471 per day per violation. Even though Virginia implements and enforces its own OSHA programs, according to the U.S. Department of Labor, the Commonwealth must also adopt these maximum penalty levels. The U.S. Department of Labor's Wage and Hour Division (DOL) and the Virginia Employment Commission (VEC) recently signed a three‐year Memorandum of Understanding regarding the misclassiﬁcation of independent contractors or other non‐employee statuses. The VEC will collaborate with DOL by providing enhanced enforcement through joint investigations and the sharing of information. 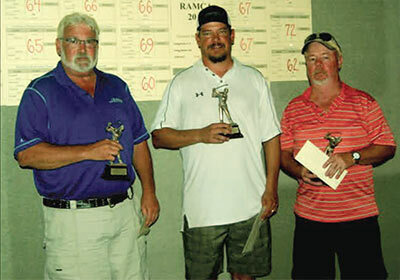 On Thursday September 8th, RAMCA held the second golf tournament of the year at the always popular Mattaponi Springs Golf Club. For the second year in a row, this tournament was a complete sellout with 30 teams competing for bragging rights. 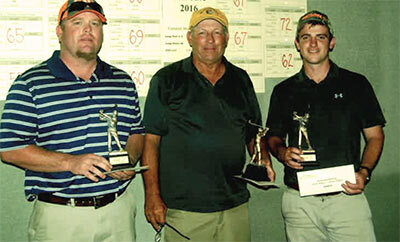 After the sweltering heat and humidity on the golf course, a delicious BBQ dinner and awards were enjoyed in the air conditioned clubhouse. Plans for a return to Mattaponi Springs for 2017 are underway with sights set on a date a few weeks later in September or early October with the hopes of playing on a beautiful fall day! Thank you to Jack Bargamin Memorial Golf Outing Sponsors! Special thanks to our Jack Bargamin Memorial Golf Outing sponsors! Every year, as the Installation of Oﬃcers and Legislator’s Night event approaches, RAMCA staﬀ checks the weather updates hourly for the week prior to the event. This year, it didn’t look good, tor‐rential downpours and heavy winds were forecast to start just as the event was due to get underway. The day before the event, the forecast looked wonderful ‐ the joys of planning an outdoor event! Luckily, RAMCA works with some wonderful people. Our venue, the Virginia War Memorial, helped get a tent erected with just two hours notice, the caterers redid all their service plans and a RAMCA member (Fortiline Waterworks) calling to see if the event was still on, volunteered to sponsor the costs of the tent ‐ a last minute, unexpected expense! The turnout was super, the rain held oﬀ until 5 minutes before the event was due to end, and everyone had a great time! The tent, adorned with lights, only added to the atmosphere! Thank you to everyone who attended and all the sponsors for making this event special. It is always a wonderful night at the VA War Memorial! RAMCA held a summer Networking Social on Thurs‐day June 16th at Pearl’s Raw Bar in the Fan District. Over 60 RAMCA members gathered in the private Vintage Room above Pearl’s for great appetizers sponsored by Louis Smith Construction, delicious oysters sponsored RJ Smith Companies, and cool, refreshing beverages sponsored by Allan Myers. The networking socials are casual gatherings with no formal agenda and have proven to be very popular outings. Your RAMCA Social Committe is busy planning winter and summer networking events for 2017! 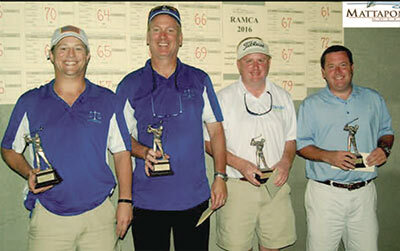 On Thursday May 12th, RAMCA held the annual George Bickerstaﬀ Memorial Golf Outing at Brickshire Golf Club. A new contest, Closest to the Pins (not pin), gave players 5 chances (R‐A‐M‐C‐A) to get closest to a pin and win a prize. Two kegs featuring Sweetwater Brewery beers from Atlanta, Georgia were strategically placed on the front nine and back nine for all players to enjoy. The Golf Committee had a surprise for everyone and arranged a drone (ﬂown by Dave Stowall and approved by Dave Moore of Slurry Pavers) to ﬁlm some high‐lights of the outing. 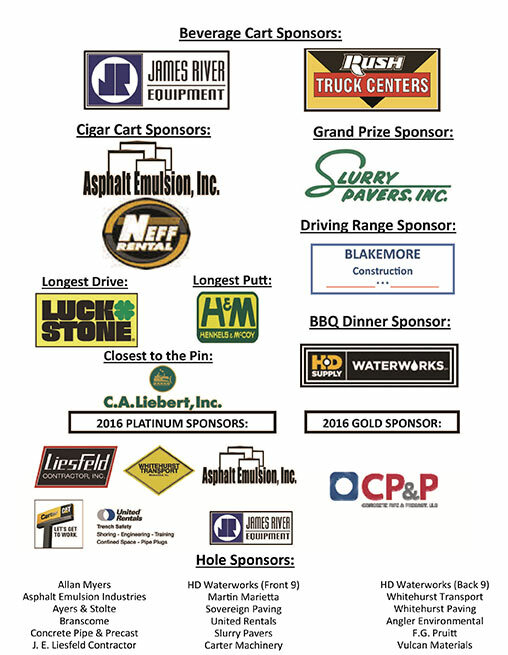 Thank You to George Bickerstaff Memorial Golf Outing Sponsors! Special thanks to our March meeting sponsors!